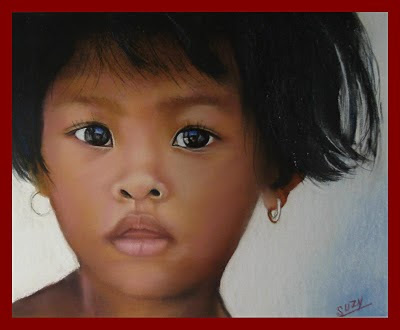 Bio: Suzy Solvery was born in 1946 near Lyons, France, where she still resides. She is entirely self-taught through constant practice, books and literature on the subject. She paints for painting's sake, pastel for Suzy is its own reward. I say chapeau, and bonne continuation! Image View: When a thumbnail is clicked it enlarges to give full information re dimension, medium and support. The thumbnails themselves seem ‘out of sync’ with the tables on the page (you will see what I mean if you look). As well as that the paintings are mostly presented after framing, which affects the size and clarity of the image. This is a pity as they merit closer inspection. I have chosen an unframed painting to display here. It is 1984x1636, 324 KB.